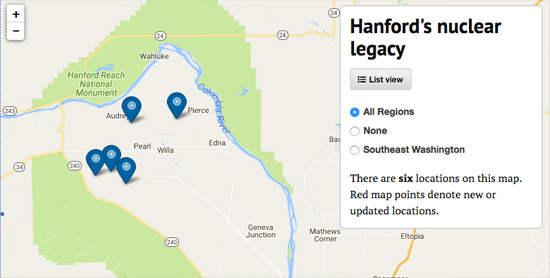 UPDATED: Tue., May 9, 2017, 8:38 p.m.
HANFORD – Thousands of Hanford workers streamed out of the Washington nuclear reservation Tuesday while operators huddled to find a fix for a gaping hole in the roof of a tunnel that entombs rail cars full of radioactive equipment. State and federal officials sought to ease fears of a leak of radioactive material, saying monitoring at the site shows no evidence of a release. Energy Secretary Rick Perry received briefings on the situation throughout Tuesday, his office said. After extensive testing at the site, “there has been no indication of worker exposure or an airborne radiological release,” Perry’s office said. Workers discovered the hole in the tunnel next to a closed facility known as the PUREX plant, short for Plutonium Uranium Extraction, near the center of Hanford. 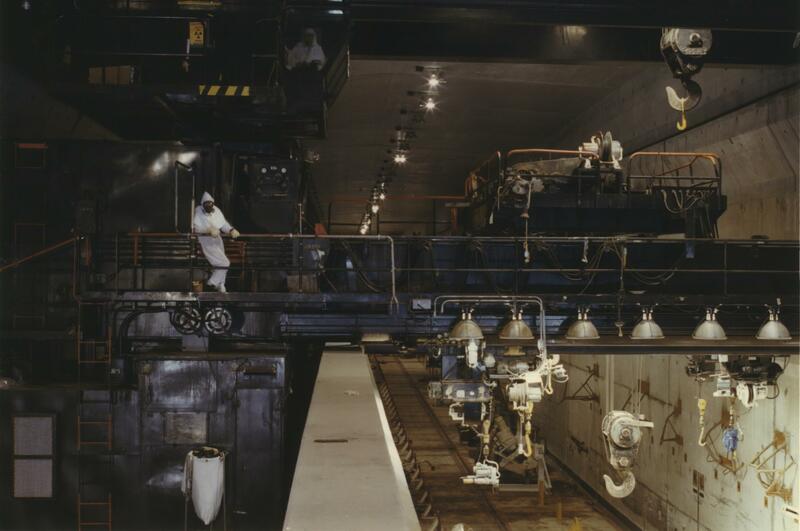 The radioactive waste contained in the tunnel is a byproduct of the nation’s effort to develop enough plutonium to fuel nuclear weapons from World War II through the Cold War. But exactly how the hole, estimated at 400 square feet, will be plugged or covered – and how long that will take – remained unclear Tuesday. Officials said they are exploring placing a barrier between the contaminated equipment inside and the outside air without causing the hole to grow bigger. No workers were injured Tuesday, said Randy Bradbury, a spokesman for the Washington state Department of Ecology. As a precaution, nearby employees were evacuated and private pilots told not to fly over the sprawling reservation, which is half the size of Rhode Island and located 124 miles southwest of Spokane. Workers near PUREX noticed the cave-in during routine monitoring, and the Hanford emergency center was activated at 8:26 a.m. There were no workers inside the tunnel when it collapsed. But nearby workers were evacuated as a precaution, the Department of Energy said. Employees close to the PUREX plant were first advised to take shelter indoors, and that was expanded to cover several thousand employees within Hanford’s security boundary. By noon most workers were told to leave work early as a precaution. By early afternoon cars were streaming out along the two-lane highway leading away from Hanford’s Vitrification Plant, a facility under construction that will turn liquid radioactive waste into glass chunks. Hanford Patrol officers, who barred any filming of their officers or car under penalty of arrest, stopped vehicles from approaching at least five miles from the site of the tunnel collapse well within the 580-square mile reservation. One contractor, who said he could not give his name, said he was forced to park and wait more than three hours after the emergency was declared. He eventually was allowed to pass through a checkpoint at 2:45 p.m.
Several other vans containing Radiological Control officers passed the same checkpoint. Those employees used hand-held detection devices which showed no contamination had been released from the tunnel, Henderson said. Closer to the collapse site, crews used a remote-operated device to monitor for possible radiological releases and take video footage of the hole. Around 1:35 p.m. the last of the employees in the vicinity of the tunnel was released from work early. Non-essential employees were released from work early or told not to report to work for swing shifts Tuesday night. Workers considered essential for site operations were told to avoid the emergency area, which is 19 miles from North Richland and about 7 miles from the Columbia River. The cave-in occurred where two tunnels – one about 360 feet long and the other about 1,700 feet long – join together east of the PUREX plant. They were built during the Cold War to store contaminated equipment from plutonium production operations at the plant. An unnamed source told NBC affiliate KING that crews doing road work may have created a vibration that caused part of the tunnel to collapse. Henderson said he was not able to confirm that. “Federal, state and local officials are coordinating closely on the response,” Inslee said, with the state Ecology Department in close communication with the Energy Department. There were no plans for Inslee, who made several previously planned stops in Skamania County on Tuesday, to go to Hanford, his staff said. Sens. Patty Murray and Maria Cantwell said they were monitoring the situation closely and that safety should be the top priority. “The initial reports are no one has been hurt but we are watching this very closely,” Murray said. Cantwell said the Energy Department and its contractors need to find out whether the subsidence in the tunnels has resulted in an environmental contamination. “My thoughts are with the first responders who are working to assess the situation on the ground, monitor any environmental impacts and design next steps for securing the area,” she said. The state and the federal government have been locked in years of litigation over cleanup of nuclear waste at Hanford that is a legacy of the nation’s weapons programs from World War II and the Cold War. “This disaster was predicted and shows the federal Energy Department’s utter recklessness in seeking decades of delay for Hanford Cleanup, and Washington State’s and EPA’s dereliction in agreeing to those delays,” Pollet said in a press release. Hanford was built during World War II and made the plutonium for most of the U.S. nuclear arsenal, including the bomb dropped on Nagasaki, Japan, at the end of the war. The closed PUREX plant was used to chemically process irradiated fuel rods to remove plutonium for weapons. It was built in the 1950s and operated from 1956 to 1972 and again from 1983 to 1990. Henderson said the tunnel in question was about 360 feet long and contained eight flatbed rail cars built in the 1950s and 1960s full of highly contaminated materials and equipment from the plant were backed into the waste disposal tunnels at the plant and left there as a disposal method. The flatbed train cars “were built to hold contaminated material that were large pieces of former plutonium processing equipment that were too large to be stored elsewhere,” Henderson said. Last year, a new legal deadline was set requiring the Department of Energy to start some work toward assessing the waste disposal tunnels by September 2017. But Henderson said he checked and found no active plans to deal with the tunnels. “The focus of the facility was to just monitor in place,” he said. Hanford has the nation’s largest depository of radioactive defense waste needing clean up. The site contains about 56 million gallons of radioactive waste, most of it in 177 underground tanks. Although the Trump administration has vowed to slash the budgets of most Energy Department programs, the administration does not plan to skimp on the department’s program charged with the Hanford cleanup and with other nuclear sites. It has requested $6.5 billion for agency’s environmental management program for 2018. This report contains information from Spokesman-Review reporters Thomas Clouse, Jim Camden and Becky Kramer, as well as The Tri-City Herald and Washington Post. Published: May 9, 2017, 10:08 a.m. Updated: May 9, 2017, 8:38 p.m.